Congratulations to the Thailand team that won the Fortis International Challenge at the Kota Permai Golf and Country Club, Malaysia two weeks ago. Thai hotshots Thongchai Jaidee and Prayad Marksaeng put on an outstanding exhibition of golf with a final round eight-under-par 64 to win this prestigious event. Thailand had a great start to the tournament by firing an 11-under-par 61 for the joint first round lead. The pair then produced a battling two-under-par 70 to take a one-stroke halfway lead, and carded a bogey-free 63 in the third round, thanks to a sparkling performance from Prayad who sank eight birdies. They finished the qualifying event for the Omega Mission Hills World Cup with a staggering 30-under-par 258 aggregate, three shots in the lead. 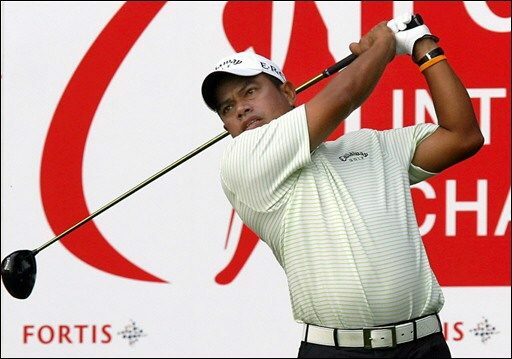 Prayad Marksaeng, born January 1966 in Hua Hin is one of Asia’s finest players. He was a member of Thailand’s winning golf team at the 1987 South East Asian Games and turned professional in 1991. He has been a member of the Asian Tour since it began in its modern form in 1995. He has won five events on the tour and was one of the first ten men to reach a million U.S. dollars in career earnings on it. Thongchai Jaidee, two times Asian number one, was born in November 1969 to a poor family in Lopburi, an old city north of Bangkok, in a house without a kitchen, flush toilet or shower. Like many Thai boys, he dreamt of being a soccer star, but instead somehow gravitated to golf, learning to swing with a homemade club he fashioned out of a bamboo branch. Then at 19, he joined the Royal Thai Army and over the next eleven years was allowed plenty of time working on his golf game. He emerged from the Army at 30, turned pro, and within a few years began winning tournaments on both the Asian and European tours. Thongchai is now one of the three biggest sports figures in Thailand. He’s seen as a working-class hero whose determination and grit have enabled him to rise from humble circumstances. His winnings now total more than US$2 million, an incredible feat for a poor Thai kid off the streets of Lopburi. Thailand’s spectacular display in the Fortis saw Thongchai’s wish come true as he has never featured in the World Cup previously. "It feels good. I have a very good partner in Prayad. He played very well this week, he was just so steady. I told Prayad that if he can hit his irons well at the start of the round, we could get some birdies early on as my putting has been good. It was easy. We didn’t miss a single green which was very good,’ said Thongchai. "I think we can go to China now with some confidence. If we can perform like this, we’ll have a good chance in the World Cup. We’ve never played at the Mission Hill’s Olazabal course before but you’ll never know. If we play like this again, we’ll have a chance," added the two-time Asian Tour number one. The Omega World Cup will be held at the Mission Hills Golf Club in China from November 22-25. By the way, whilst on the subject of Pro golf, don’t forget that the Volvo Masters of Asia will be held at Thai Country Club, Bangkok December 13-16. Why not time your Thailand golfing holiday for around those dates and watch the top Thailand players and other top Asian golfers fight it out for the US$650,000 prize money? My Thailand golf vacation company has limited VIP tickets available for free for anyone here on a Thailand golf package at that time! Feel free to contact meat my Thailand golf vacation company.